It was Mr Ramesh Kumar himself who broached the subject in response to Mr Kumaraswamy's letter bringing the tape's contents to his notice. 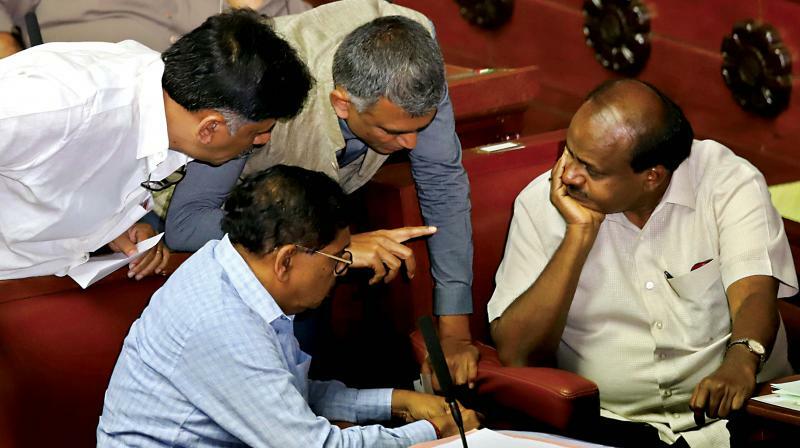 Bengaluru: Acting on the suggestion of Speaker K.R. Ramesh Kumar, Chief Minister H. D. Kumaraswamy announced on Monday that the matter of the tape on which state BJP chief, B S Yeddyurappa is allegedly heard trying to lure a JD(S) MLA to his party, would be handed over to a Special Investigation Team (SIT) for inquiry. The Chief Minister made the announcement in the legislative assembly following a heated debate between the opposition and ruling parties on the contents of the tape. It was Mr Ramesh Kumar himself who broached the subject in response to Mr Kumaraswamy's letter bringing the tape's contents to his notice. As he prepared to give his ruling in the matter, Rural Development and Panchayat Raj (RDPR) Minister, Krishna Byregowda, interrupted to insist that the issue merited a detailed discussion. He then went on to read the transcript of the tape in the House to strong objections from BJP members, who alleged that the CM had masterminded the audio clip and released it to the media. Rubbishing the allegation against him, Mr Ramesh Kumar said furiously that either the person making it should quit politics or he would. “If someone feels he can remove from this House by provoking me, he is mistaken. We must know who this person is. Did he approach me directly or one of my family members? What denomination of money was paid to me? I was unanimously elected as Speaker with members reposing faith in my integrity and I have never acted in any way to attract such claims,”' he said. Although BJP members pleaded with him to reconsider his decision, Mr Ramesh Kumar stuck to his guns saying an inquiry by a House committee or a judicial inquiry would take too long and once the Chief Minister had agreed to his suggestion on a SIT inquiry into the tape, adjourned the House for the day.